6. 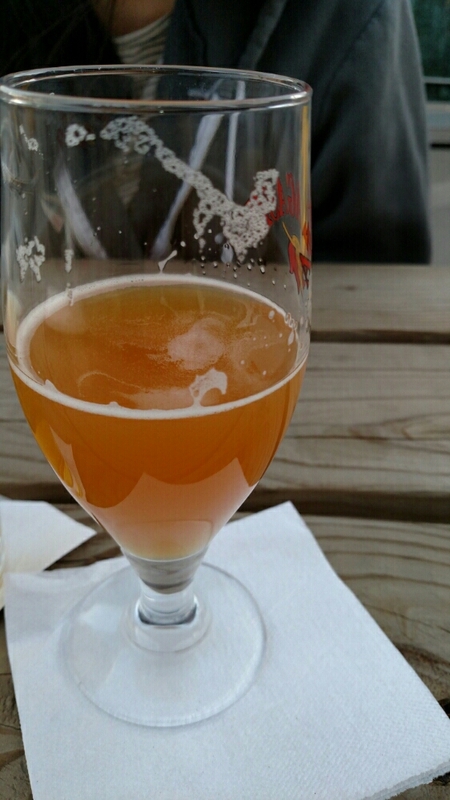 Lilikoio - Avery (CO) passion fruit ale. Whenever I'm at a Hawaiian restaurant that doesn't serve traditional style shaved ice, I'm a total sucker for buying the lilikoio juice in a can. Almost every place carries it. 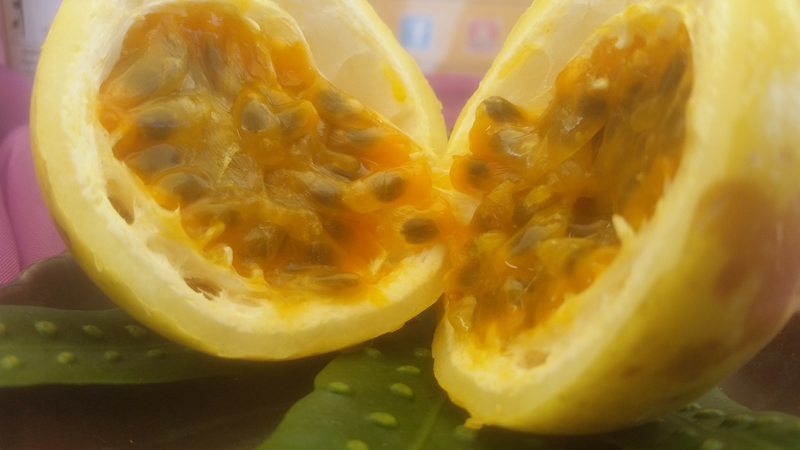 It's basically a thirst quenching passion fruit kids drink acceptable for adults. Avery's ale version hits the right notes of the original drink without forgetting that it's beer and not a Capri Sun. A friend told me this was one of his top 5 favorite IPAs/double IPAs so I had to call up Torst bar in Brooklyn at 11:05am (they open at 11) and find out if it was indeed on tap. 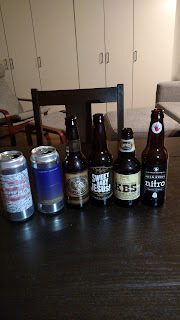 It was definitely a productive double IPA but it won't be making any lists of mine beyond best of the month. 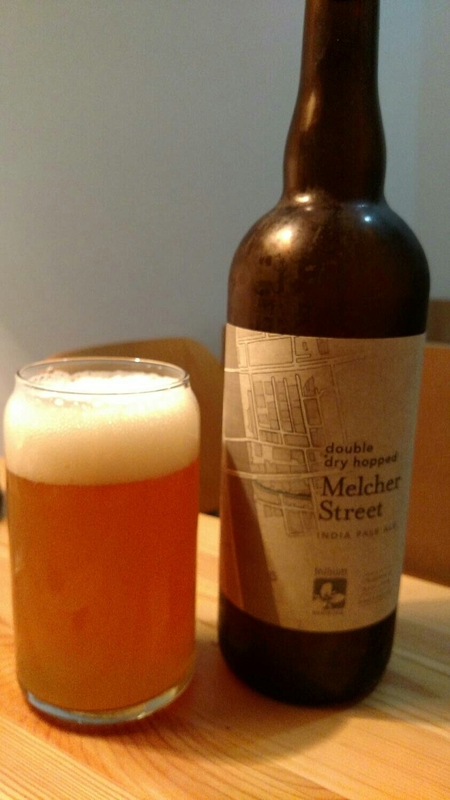 Other Half are quickly becoming known as one of the breweries everyone wants to collab with. 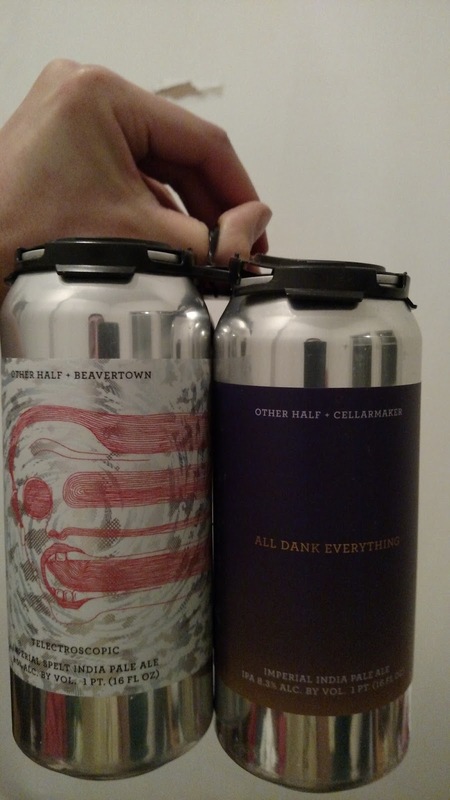 They also released All Dank Everything with CellarMaker from San Francisco the same day. Telectroscopic makes my list because it was well executed and original. How many spelt beers have you tried? First of all Gose has become the chameleon of craft beer styles. Every new one I try seems to be on a completely different pallet spectrum than anything I've tried previously. This one almost falls into a winter ale category for me. A lot of spices are present. Not sure how it works as a gose, but it just does. You know how oftentimes with wine the label reads of fifteen flavors and most non-sommeliers only detect like three? Craft beer can land in that zone of empty promises as well, but not Sweet Baby Jesus. It says Chocolate and Peanutbutter and that's exactly what you get, mmm. Trying Trillium has been on my beer bucket list for a while. Last time I was in Boston it was a weekend and they closed too early Saturday for me to make it a d they're closed all day on Sundays. I about popped my cork with frustration. Thankfully I have amazing friends. 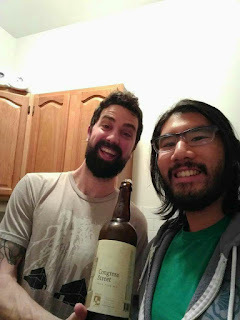 One of my good buddies brought me three bottles, including Congress Street and Mosaic dry hopped Fort Point to try when he came out to NYC for a conference. All three bottles I tried got A+ grades from me. This one just happened to be my favorite of the haul. 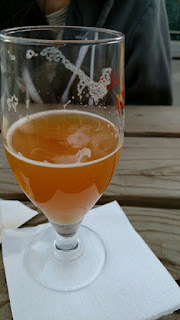 Brewed Food: Culinary Beer Integration Is The Future! 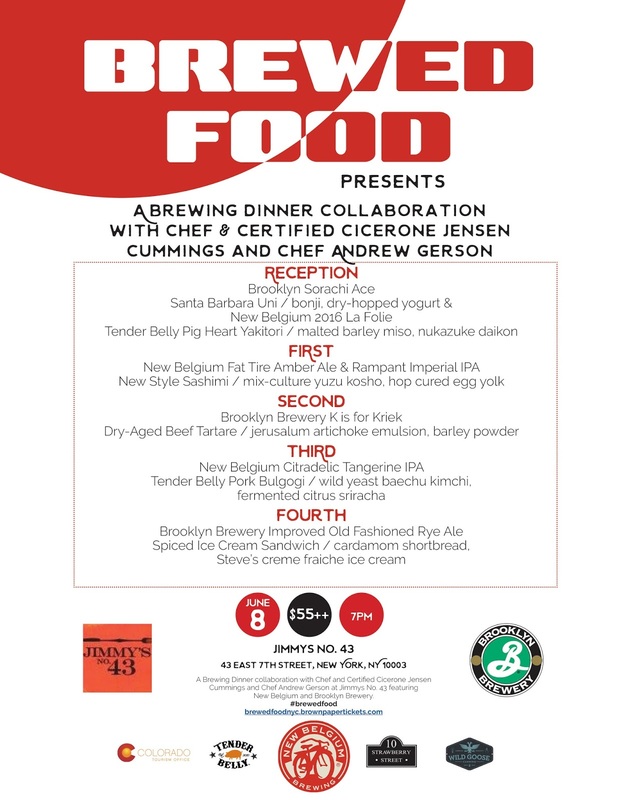 There is a culinary collective changing the rules in the beer dinner game right now. I'll even go as far as to say they're re-writing the rules all together. No, the first rule isn't nobody talks about beer dinner club. The first rule is forget all the rules, these guys are reinventing the wheel. Obviously intrigued by the science, creativity, and innovation behind this new movement I needed to learn more. Step one, meet the chef! 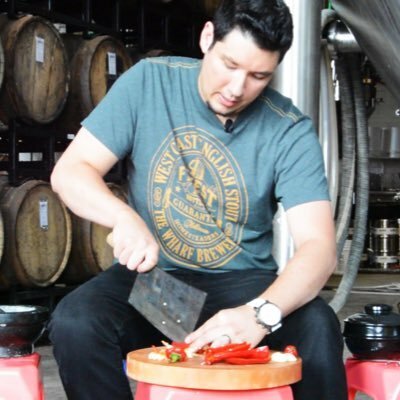 I interviewed Jensen Cummings, Chef and certified cicerone of Brewed Food. When I say interviewed, I mean we had a hearty conversation full of laughs and good spirits that happened to be centered around learning what Brewed Food is all about. 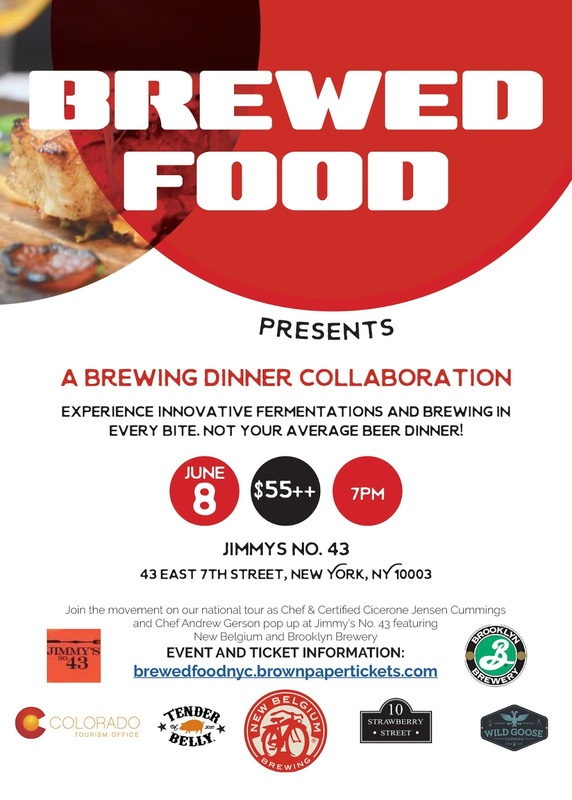 Below is the menu for Brewed Food's upcoming pop-up event in New York City, June 8th at Jimmy's No.43. I've been extremely unfortunate to be headed to Portland, Oregon just after they recently held an event a Korean restaurant there called Biwa. Then even more ironically I will be there and away from my home in NYC during the pop-up at Jimmy's No. 43. I'm hoping some of our friends and readers will have a chance to attend the dinner and rub it in/ fill me in with all the details. Pimpin: Ugh, so what'd I miss at your Biwa event in Portland? 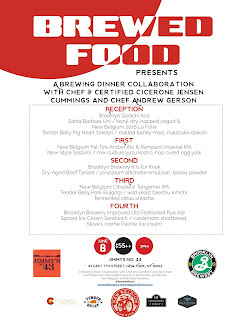 Chef: It was also a collaboration with Basecamp Brewing. Pimpin: Those are the guys that make the s'more stout? Chef: Yes, the one that is served on tap with a flame toasted marshmallow on the rim of the glass for a beautiful presentation. They also are known for their flagship In-Tents I.P.L. Pimpin: North-Westerners know camping as well as they know beer, that's for sure. What was one of the highlights from this dinner? Chef: We made a miso with brewing grains and used a Belgian tripel with fermented picked vegetables in a rice broth bowl. Pimpin: This is a great example of what you guy are all about. BrewedFood seems to be way outside of the box from your typical "these foods pair best with these styles of beer." Is there an over-all theme or science behind the way you create your menus? Chef: Our approach being a segue of fermentation already exists in things like sauerkraut and kimchi. We take a flip-side approach to working with beer and draw inspiration from the brewing process, leaning more towards techniques that involve blending. These practices are foreign coming from a culinary background and its been really exciting pioneering this movement. I had the pleasure of working with brew masters at New Belgium one of the Largest brewers specializing in Belgian beer in the country. We created a fermented blended sriracha using fermented fruit like grapefruit and blood oranges. We varied the flavors by using different fermentation lengths, we made a one month, three month, and a six month fermented sriracha. It's definitely the beginning of a real movement in the food world we've gotten to work with James Beard and Michelin Star rated chefs. The first step is to show the process can created at the most basic level. I like to use honey mustard as the perfect example, its like our gateway drug to getting people interested and the movement gaining more exposure. Everyone makes a honey mustard its one of the most commonly made in-house condiment. We demonstrate how simple it is to take (brewers) wort and cook it down to an agave-like consistency, its very sweet and we use that instead of honey in the honey mustard. Something any brew pub could do. 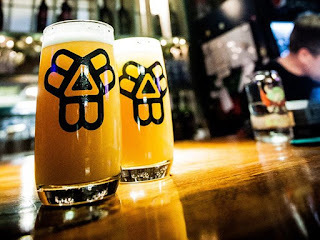 Pimpin: What's the biggest disaster you've created while experimenting with BrewedFood? Any mosaic hop cheesecake? Chef: Fermentation has resulted in our greatest successes and our biggest fails. Unlike most traditional cooking techniques fermenting can cause a heartache 6 months in the making. When we utilize beer yeasts to ferment foods and also to applying to process to hijacked equipment. Like using a pressure vacuum in plastic bags cuts the fermentation process in half but no oxygen transfer within the bags can cause an explosion. We once made a red chili kimchi with this method and the bags exploded all over the entire room. It looked like a bloody mass murder scene from C.S.I.. 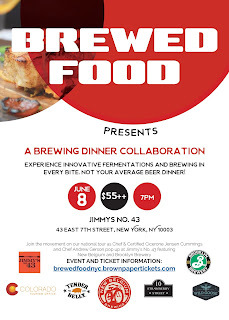 Here's the flyer for the New York City pop-up brewing dinner June 8th at Jimmy's No. 43. Guaranteed a delicious meal and an eye opening experience for beer lovers as well as foodies. Pimpin: One final fun question for ya Jensen. If you were trapped on a desert island, because most islands are deserts right, that makes a total of zero sense. Let me rephrase this, if you were trapped on a deserted island, and you could only bring three beers what would they be? Chef: 1. Bell's Two Hearted Ale. It has a great malty character and is very distinct versus the west coast IPA's that I was familiar with before trying it. It was a game changer for me when I was newer to craft beer. Pimpin: Great choice! Too many excellent beers like Bell's Two Hearted get overlooked these days in this new fast paced world where a million new beers are made every day and everyone wants to newest thing. Chef: 2. New Belgium La Folie. An American sour brown, a flanders oud bruin, inspired by the blenders connection and experience with wood-aging. It spends one to three years in oak barrels known as foeders and is considered by many to be one of the best American sour beers around. Pimpin: Yes! I love sours, New Belgium, and La Folie specifically is an excellent beer. Chef: 3. One of the first beers that helped me realize there was more to offer from beer than Natty Ice was Fullers ESB. It always brings me back and humbles me, remembering a time when I knew nothing about beer. Its a reminder that I want to inspire and educate people about craft beer without coming off as pretentious. Pimpin: Solid, I agree beer snobs are the worst. 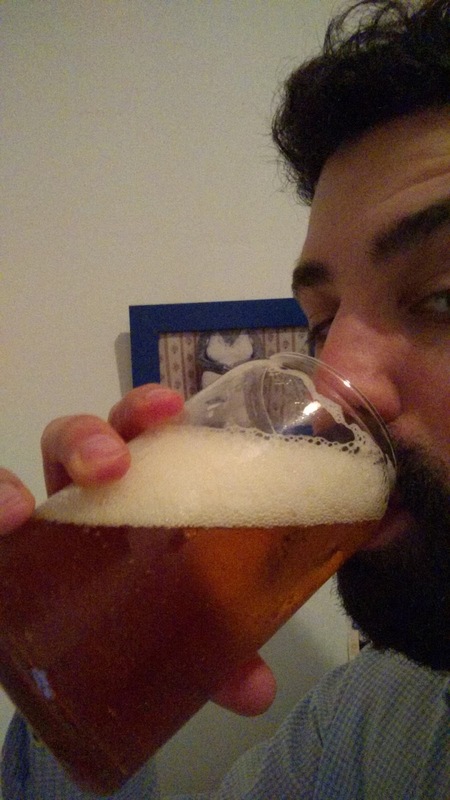 I've definitely been guilty of beer snobbery from time to time but that's not what I'm about either. People too often forget the beauty of subjective taste. Thanks again for sharing with us at Pimpin' Aint Yeasty. I'm sure many of our readers including myself will find our way to attend one of you events in the near future. Keep innovating, breaking rules and spreading the movement. You guys are truly stretching the possibilities of what can be created using brewing techniques, processes, and ingredients in cooking.